So, without further adieu, here is a list of 7 things you can do to sharpen your mental game and play your best golf. The primary thought for any shot is focus. Too many swing thoughts can interfere with the ability to focus. Thoughts about your grip, your takeaway, and the downswing are too often not subordinate and subliminal in nature. When addressing the ball, it’s all about that shot. Decide the best shot for the situation, according to your game, and focus on what needs to happen for a successful outcome. Once you’ve visualized the right shot, all that’s left to do is execute it, just let the swing happen. How important is it to stay positive? The saying “if you don’t have something positive to say, don’t say anything at all” applies more on the golf course than perhaps any other place. It’s easy to get down on yourself after a bad shot, but the negative thoughts that creep in will only get in the way of your next shot. The best golfers find a way to stay positive, no matter the circumstances. Even a bad break on the golf course is an opportunity for them to do something amazing. It’s just how they think. And after all, it’s just a game, and the good players approach it that way. Less is more. There are so many thoughts happening during the swing that it makes consistent, solid contact illusive. In golf, it’s best to keep our conscious minds out of the way. The truth is that it’s hard to swing and think about nothing. But, limiting the thinking to one single thought will allow you to better focus and lead to better results. And, it’s a good idea to consistently use the same pre-shot routine as it will provide a shield against negative thoughts that tend to creep in. For any given round, it’s important to play for the process, not the score. One of the world’s great golf teachers, Bob Rotella, wants his students to have “process goals” rather than “scoring goals.” Not all progress is results-oriented. Perhaps you set a goal of having a consistent pre-shot routine for an entire round, or maybe you simply want to get through a round without losing your temper. Or maybe you have a goal to stay hazard-free. In any case, if the scorecard is the only barometer for positive results, then you allow your success or failure to be dictated by the score only. This will prevent you from managing the aspects of your game that lead to success. Approach your game with an attitude to improve consistency in your thinking and process, and you will inevitably achieve better scores. Not many golfers are capable of striping a perfect shot from the pine straw behind a tree at Augusta, like Phil Mickelson did on No. 13 en route to his 2010 Masters victory. By all accounts, it was one of the great shots in golf history, but rest assured, he knew he had that shot before he ever decided to hit it. Par is a great score —not flashy but usually all that is needed. Many amateur golfers are affected by the “hero” shot, often going for the green in two from outside their range or trying to hit the miracle flop from the rough. As gratifying as these shots are when executed, they are most often unsuccessful and many times add additional strokes to your score. If you put two golfers of equal ability next to each other, the more confident golfer will win every time. There is no real answer for why that is, but it is the truth nonetheless. Perhaps the first thing you need to understand is that you probably know more than you think you know. That is, you know how to hit good golf shots because you’ve done it. Having the belief that you can and will do it again can make the difference between a good round and a bad one. Golf places a physical demand on specific parts of the body. Like any sport it’s important to have time before a round to properly warm up. Stretch to avoid injury. Eat the right foods before you play and drink plenty of water. The physical preparation will manifest itself into proper mental preparation. Take the time to hit some putts. Hit a few chips. Practice visualizing shots before you hit them. 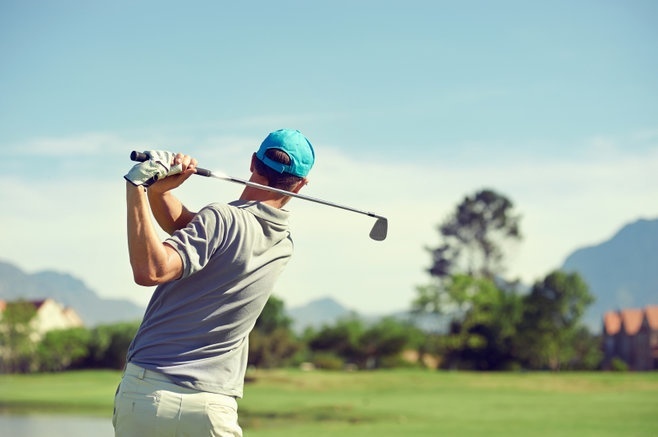 And knowing that you had a purpose to preparing to play golf will lead to better shots not just off the first tee, but throughout your rounds. Can you think of some mental aspects that are holding you back from playing your best? What are some other things that championship-level golfers do to strengthen their mental game?